Beautiful things happen in a personalized and organized workspace. Less time searching and being distracted, more time creating and being productive. If your desk or wherever you work is appearing less than a reflection of a clear-minded, dream-chasing rockstar, let’s walk through a pretty simple plan to not only get that space clutter-free and helping you achieve your goals but keep it that way, too! A CLEAN SLATE KEEPS YOU CLEAR MINDED. A messy workspace promotes distraction and has the potential to overwhelm you and really annoy anyone else sharing the space, too. When you may already have many other projects, responsibilities and activities on your mind, a clear working space keeps you better focused, efficient and clear-headed. Don’t miss this: Here are lots of tips to stay laser focused and calm no matter what! A TIDY DESK IMPROVES YOUR MEMORY. A tidy desk with a calendar and to-do list within easy sight and reach helps you remember important appointments and tasks. If that calendar is covered up with numerous files and other papers, you may miss the mental reminder! Keep your papers at a minimum on your desktop to jog your memory of the critical stuff. Don’t miss this: Morning coffee drinker? Learn here many ways to make coffee a lot healthier! A CLEAN SPACE LEAVES ROOM FOR SPARKING CREATIVITY. All those amazing ideas roaming around in your head – you must record them somewhere! But, if your desk is a mishmash and you have stuff everywhere it just might distract you and you forget those amazing life-changing ideas of yours. Keep your desk clean so that you can focus on that idea and break it down better without being bombarded by side projects, activities or looming deadlines. Don’t miss this: Here are loads and loads of ideas to be the most interesting person in the room! AN ORGANIZED DESK GIVES YOU TIME FOR MORE FUN THINGS! 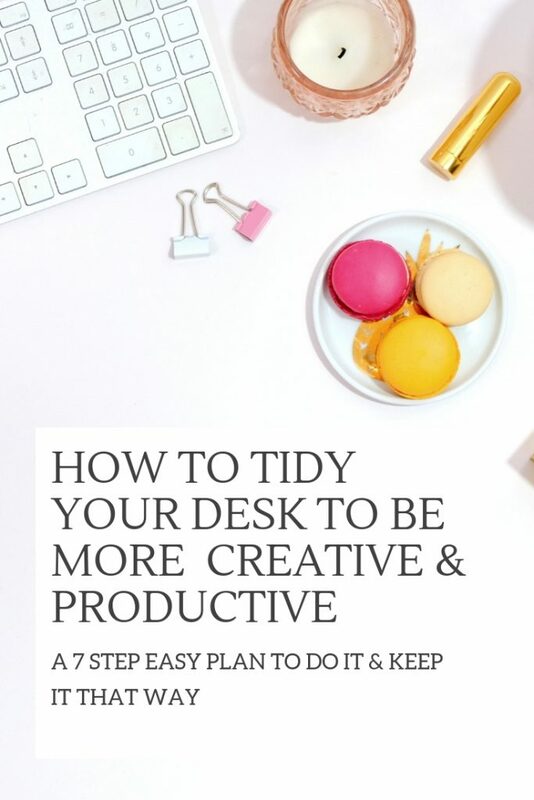 Tidying up your desk daily could seem like another tedious task, but if you added up all the time you waste and stress you create by re-sorting through the big pile-up on your desk when you don’t tidy up regularly, it would be more than you care to admit. When you keep your desk items to those you only use daily or weekly, you are guaranteed to have less to sort and put away and more time to do the interesting stuff! Don’t miss this: Here is a top-rated guru on stress-free productivity and time management. 1. TAKE EVERYTHING OFF YOUR DESK. With the exception of your light source and computer, take everything off the top of your desk and in your desk. Nothing goes back on it or in it without a very good reason. See step number 3 in bold as it is critical to success. 2. GROUP LIKE WITH LIKE. 3. REVIEW BOX CONTENTS WITH CARE. This is the most time-consuming task. Go through all your boxes one by one and trash or donate whatever you can from the boxes first. Be discerning here. If you have not used the item in the last month or so, chances are you do not need it or could place it elsewhere besides your desk. If an item is broken, get it fixed or recycle it. Do not put it back on your desk. For the box labeled unsure, keep that box in a closet for a few months and see if you actually ever need those items. You can mark a date on your calendar in the future to remind yourself to check it and see if you can toss some more! The key to success is this: limit your desktop to only the items you use on a daily or weekly basis. Remove anything without that purpose. Other items should be placed in your filing cabinet, storage closet or another area for items used occasionally. 4. MAKE A LIST OF ORGANIZING ITEMS YOU MAY NEED. Look around your home and office first to see if anything you already have can help you keep your desktop better organized and tidy. Cups for pens or baskets you may have for catalogs or drafting papers, etc. See the “Shop Desk Organization” section below for some great items that could help you out. Create project files or boxes with labels to keep away from your desk area and store in a filing cabinet or other area. (These project boxes with nameplates are my favorite to keep things tidy and easy to find in seconds.) This helps you stay focused on the current task at hand and not get distracted from other projects on your plate that do not require your attention right now. I suggest some kind of “inbox” for a home office and at work for when family members or coworkers stop by with papers that need to be signed, completed, etc. and you can put those in your inbox and not allow them to float around or pile on your desk. This also keeps messages/communications from others away from your carefully organized project files mentioned above. You can create an inbox on a wall or other area in your workspace. It doesn’t even have to be on your desk as it could distract you as well. 5. CLEAN YOUR DESK THOROUGHLY. With a cleared desk and drawers, now is the perfect time to clean the desktop and vacuum the drawers out before placing items back. Don’t miss this: Here is an effective and computer-safe non-toxic cleaner to keep your workspace clean and toxin-free! This is your personal space so surround yourself with inspiration and nothing draining or negative in any way. Bring in a select number of personal items (1 to 3 should be fine) that you would like to have around you while your work. Whether this is a piece of art, a photo of your family, an inspiring mood board you created, favorite supplies, a beautiful plant or fresh flowers – keep it cohesive, inspiring and not too distracting. Don’t miss this: Here is a great place for reasonably priced plants that come right to your door! At the end of your work session or at the end of the day, taking 2-3 minutes to tidy up keeps you on track to keeping an organized desk and life! Just a few minutes can do wonders! File away papers that you do not need tomorrow, put your supplies back, trash anything you can, and do clean your coffee mug. Be intentional about continuing to sort and discard documents once they’ve served their purpose. Making a list of the top 3 things you want to accomplish the next day is a great idea to start your next work session with purpose. FOR MORE ON THE TOPIC . . . I know I have my favorite pens that never let me down, but here are some other best pens rated and reviewed. Suffer from sore wrists from heavy computer use? Here is a top rated ergonomic mouse to really help with that and prevent further injury. Maybe one of these ergonomic chairs according to back specialists could be a good choice for you at your desk. It is critical to keep those medical records straight. Here is how to do it and some great tools to help!